In the overall plan of my life, I will eventually own a house with white walls. Preferably an old Virginia farm house near the Blue Ridge. And when I do, I might consider this for the stairwell. 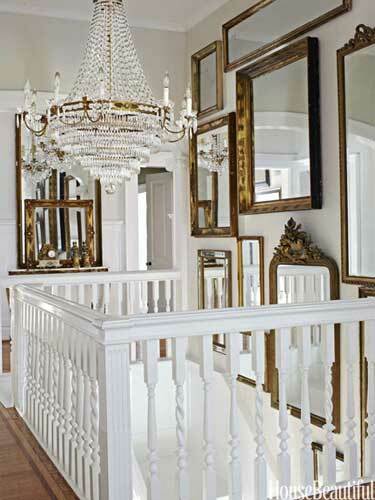 Mirrors for days...a beautiful way to display a collection (and a great excuse to stockpile antique mirrors). Y'all, it's cold. Really cold. But I'm not complaining. I love cold weather...maybe not frigid weather...but give me sweater weather over summer sweat any day. Hope you're staying warm and have an enjoyable weekend. See you next week! yes to the virginia farmhouse! i'm wanting to buy one of those too...a lovely estate for the whole family to gather. my fave neighborhood is keswick- i'm on a constant hunt for something near there!